Kat and her single mother live a hectic and stressful life in London, where her mother is an underling in a sketchy vet practice. When their home is broken into, Kat's mother decides they must leave. They look for new jobs, and find one in a small coastal town where the vet passes away and left not only the practice but a house, car, and temperamental cat! They move, and are immediately welcomed by the vet-starved populace. Kat is hoping to save up for her own computer, so she starts a pet sitting and walking business. Once of her first customers is the Portuguese bird artist Ramon, who wants her to watch his talking bird, Bailey. When Kat shows up to work, she finds suspicious circumstances and thinks that something has happened to him. She lets Officer Singh know, but there are other, bigger mysteries going on in England at the time, one involving her estranged grandfather, who is the Minister of Defense. 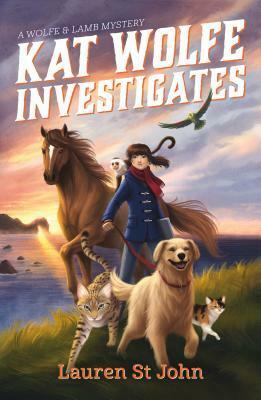 With the help of Harper, who has broken both legs in a fall from her horse, necessitating her father hiring Kat to exercise the animal, and local retired librarian Edith, Kat stumbles into a world of international intrigue. Strengths: I loved the scenes where Kat and her mother move into the small town and set up their veterinary practice. I've spent too much time over the summer watching shows like Doc Martin and That's My Boy, and the descriptions are similar to what is described about small town life in those places. This then segues into more of the British type of murder mysteries, with M15 and other more serious organizations. Students love this sort of thing, which makes this title an interesting mix of All Creatures Great and Small meets Stormbreaker. Weaknesses: It was a bit of a jolt when this changed from the cozy seaside veterinary practice to the disappearance of Ramon. I just wasn't expecting it from the cover and description. When the fifth graders of Liberty Falls Elementary School take there annual trip to Mink's Mystery Mansion, the children who go have their own agendas in mind. Aaron has just changed schools again, and hopes to be able to make new friends. With his father in the military, he should be used to change, but it's still hard. Eddie is related to the inventor, Edward Minks, but his family is struggling financially, since Minks gave away all of his money for the greater good. Eddie has blueprints of the mansion and hopes to find a secret room with a book detailing all of his ancestor's undiscovered inventions. Jessie also hopes to make friends, and finds a kindred spirit in Anna, who has brought her rabbit Mopey along in her backpack. Chloe hopes to continue in the good graces of the popular Sophie, but starts to realize how mean and selfish her supposed friend is. 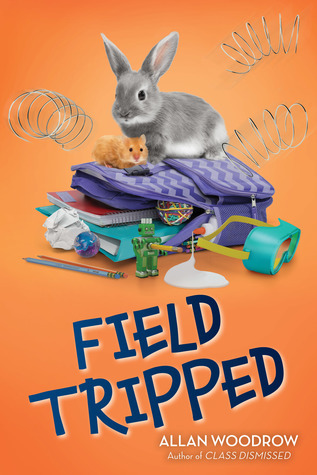 When a horrible snowstorm strands the school at the mansion, the children try to investigate and find the inventions-- some so they can earn money, and some so they don't have to write an assigned paper on their field trip. Strengths: I really like Woodrow's work, especially Pet Wars, and there are not enough books about field trips. Not that my students ever take them, thanks to budget cuts, but they are always fun both to go on and to read about. This is a bit different from Woodrow's other school stories in that it has a Charlie and the Chocolate Factory or Mr. Lemoncello's Library vibe to it, with funny inventions, odd occurrences, and a mystery to be solved. The relationships between students evolve in realistic ways. The cover is fantastic. More books should have Slinkies on the cover! Weaknesses: This is a solidly elementary school book. The goofiness falls on that side of the Pilkey Line, and the characters all have more elementary concerns. Jessie's cat back pack that meows was a big indicator of that. If Mr. Lemoncello did better in my library, I would keep this, but I think I will send it along to the elementary school. What I really think: I would definitely purchase this for elementary. Having a narrow interest range isn't really a weakness-- it just makes it sad for me when I relaly like a book but know my students are just not going to vibrate to it.